Chichester City remain ten points clear at the top of the SCFL premier division with five games to go after a second half come-back against Lingfield. Six points from those five games will be enough for Chi to lift the title,although City boss Miles Rutherford has already warned about taking anything for granted with some tough games ahead. Rutherford and assistant manager Graeme Gee made one change to the side that beat Little Common, with Ryan Peake returning to the starting XI in place of Rob Hutchings. The Lingers, who were promoted from division one last year, are celebrating their 125th anniversary this season. They finished 2018 on fire and picked up the Team of the Month award with five wins in December and came into this match on a run of four games unbeaten, including an impressive draw away at title contenders Newhaven. Chi overwhelmed Lingfield in the reverse fixture in September at Oaklands Park when goals from Hutchings, Matt Axell and Gicu Iordache together with doubles from both Kaleem Haitham and Scott Jones gave City a magnificent 7-0 win. Here, it was the home side who started brighter with skipper David Heaton shooting high and wide inside 60 seconds. Moments later Jones, a perfect hat-trick hero last time out, had the ball in the back of the net after a bit of skill from Iordache but the No9 was offside. A smart low free-kick by Conor Wilford then gave Ryan Young something to think about as the visitors struggled to settle. At the other end George Way’s defence splitting pass might have got Jones away. The striker’s touch was a little too heavy though and Dan Burnett was first to the ball. Wilford, who looked dangerous from set pieces all game, stung Young’s gloves in the 12th minute before Jones fired an effort over after a super pass from Ben Pashley. Lingfield took the lead in their next attack when Chris Ransome capitalised on a slip from Terrell Lewis and lobbed Young. Josh Clack had an opportunity to equalise almost immediately but hit his shot straight at Burnett. The hosts’ keeper then did well to gather Way’s free-kick under pressure from Peake. Stephen Hodge picked up the first yellow card of the day from referee Darren Eaton for a foul on Rory Biggs – Biggs, Clack, Iordache, and City captain Connor Cody would later join Hodge in the book. Chichester forced a first corner on the half hour mark and Burnett just managed to turn Clack’s header over. It was all Lingfield for a spell and Jamie Bakhit spurned a glorious chance to increase the home side’s advantage at the far post. There were opportunities for the visitors too heading towards the break - a shot from Way was blocked and Burnett tipped another effort on to the bar. The triple substitution at the interval was instrumental in the league leaders’ turn of fortune. Rutherford and Gee rejigged things at the back and in midfield, introducing Hutchings, Haitham and Emmett Dunn for Way, Axell and Lewis. And within a couple of minutes or so the bold move paid off when Haitham lashed in the equaliser after good feet and a precision pass from Iordache. Ransome might have/should have bagged a second on 51 minutes but flashed a header wide from another Wilford free-kick. Cody thought he had put the visitors in front with a well-placed header but the goal was ruled out for offside. The momentum changed. Jones crashed a header against the bar but Clack couldn’t put the rebound away before Iodarche fizzed a shot narrowly off target. Clack made amends from close range with his fourteenth goal since October to give Chichester the lead after Burnett could only parry Jones’ attempt. Lingfield sub Lorenzo Lewis made an impact and might have got in but for a timely tackle from Cody before whipping in a cross that Peake cleared. Clack could have had another after Jones forced a fine save out of Burnett. The Lingfield keeper did well again to deny Clack and then had his defenders to thank for excellent challenges when Clack burst into the box on two more occasions late on. Iordache made it 3-1 in stoppage time drilling a shot in at the near post for Chichester's 89th league goal of the campaign and a sixth consecutive premier division victory. 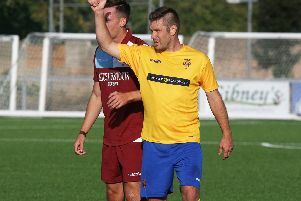 Newhaven, in third spot, lost further ground after a 0-0 draw at home to Broadbridge Heath, whilst second placed Horsham YMCA and fourth placed Eastbourne Town both won. Chi are on the road again in their next league match against Shoreham on Saturday (March 30).